After much deliberation, the non-academic unions of universities under the umbrella of JAC of SSANU, NASU, NAAT has suspended the three-month strike. The industrial strike which started since December 4, 2017, has been suspended today. The JAC comprises of the National Association of Academic Technologists (NAAT), the Non-Academic Staff Union of Educational (NASU) and Associated Institutions and the Senior Staff Association of Nigerian Universities (SSANU). Government is to source for eight(8) billion naira within five (5) weeks to pay JAC of SSANU, NAAT and NASU members and members of the Academic Staff Union of Universities (ASUU) in the University of Nigeria, Nsukka (UNN) and University of IIorin (UNILORIN), who did not get paid in the last disbursement exercise. 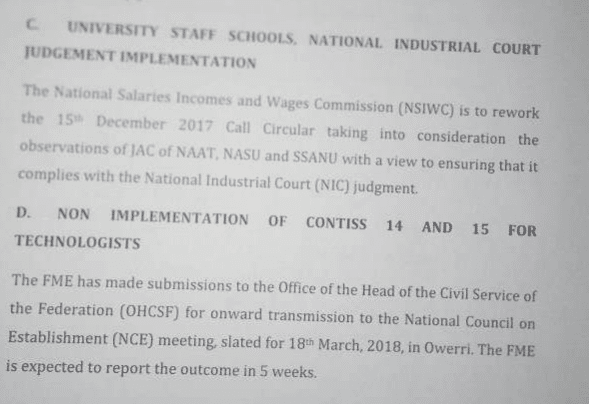 The National Salaries Incomes and Wages Commission (NSIWC) is to rework the 15th December 2017 Call Circular taking into consideration the observations of JAC of NAAT, NASU and SSANU with a view to ensuring that it complies with the National Industrial Court (NIC) judgement. The FME has made submissions to the Office of the Head of the Civil Service of the Federation (OHCSF) for onward transmission to the National Council on Establishment (NCE) meeting slated for 18th March, 2018, in Owerri. FME is expected to report the outcome in 5 weeks. The Federal Ministry of Education had put forward an application for the visitation panel to the Presidency. The FME is to follow-up and report out in 5 weeks. The thrust of the visitation is to energize the institution, unearth corruption and maladministration in these institutions. It was also agreed that the FME would set in motion appropriate machinery for the release of White Paper in respect of previous visitation panel reports already with Government. E. The Honourable Minister of Labour and JAC Leadership agreed that the ongoing strike would be suspended by Wednesday 14th March 2018, after due consultation with their National Executive Councils (NECs). F. No Worker would be victimized on account of this industrial action.